As the US-Russia brokered Syrian ceasefire looms, Secretary John Kerry has been displaying a warm attitude towards Moscow, stressing mutual goals and cooperation, but the Pentagon appears to be reading from a different playbook, calling Russia an enemy. On Thursday, the US Secretary of State testified before Congress trying to sell legislators on a $50 billion budget for his department, calling it “the minimum price” for America’s leadership for the next year. In his fourth testimony this week, Kerry pointed out the scope of the US’ “simultaneous” engagements across the world, while also stressing the need to keep national security strong and protect America’s interests. With regard to Washington’s international challenges, specifically the scale of radical Islamic extremism, Kerry was asked if he agreed that Russia poses a greater threat than jihadists. “If you wanted me to put on the table the top threat to the United States today, in terms of day to day life and the stability of the world, it is violent extremism, radical religious extremism and violence…” he began to reply. 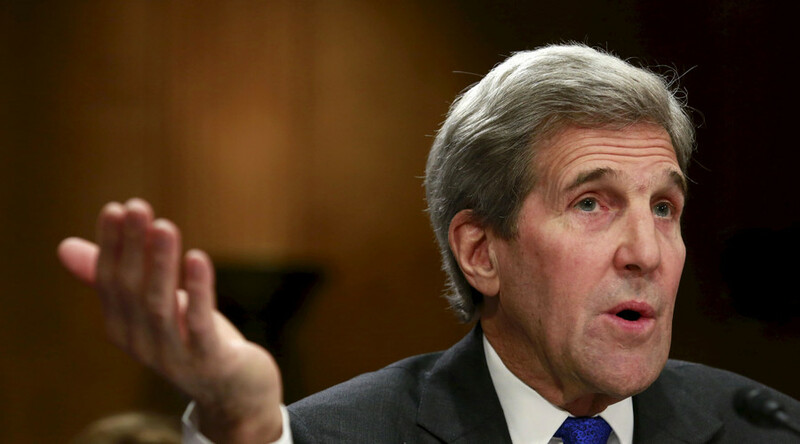 Kerry was interrupted by Congressman Dana Rohrabacher (R-California), who called the Secretary out for being “unable” to say “radical Islamic” when referring to terrorism. Beginning with President Obama’s comments of September 2014, when he said Russia posed more of a threat than Islamic State, the US has repeatedly labeled Moscow as a top threat to America’s national security. “What the Defense Department and others have been saying is that they see activities that Russia is engaged in, which present challenges – for instance, what happened to Crimea, what happened in Donbass, what happens with support for the separatists, the long process of back and forth on Minsk implementation – is interpreted by the frontline states as a threat,” Kerry explained. While “touring” Capitol Hill this week, the Secretary has been trying to persuade lawmakers of Russia’s essential cooperation and key role in hammering out the Syrian ceasefire deal, notably in contrast with the Obama’s administration’s frequent anti-Russian rhetoric. While the State Department is looking for $50 billion, as the US is “trying to cooperate with Russia” in fighting Islamic State, the Pentagon is seeking $582.7 billion to counter Russia and China, America’s “most stressing competitors,” in the words of Defense Secretary Ash Carter. “To counter Russia, Eucom, working with allies and partners, is deterring Russia now and preparing to fight and win if necessary,” Breedlove, the commander of US forces in Europe, said. However, at least for Congressman Rohrabacher, this sounds like a non-starter.